Immolation is a band that never overdone it with releasing albums, thus creating healthy anticipation around each subsequent release. With 2002's "Unholy Cult" the band reached its creative peak in terms of songwriting and production. Now there's "Harnessing Ruin" which introduces a couple of notable differences to their earlier body of work. Once more Paul Orofino helms the production, the subsequent similarities that "Harnessing Ruin" has to its predecessors are therefore no surprise. While undeniably Immolation's strongest outing to date, this record does show a few signs of stagnation. First off, the obvious changes in the line-up. ex-Angel Corpse guitarist Bill Taylor has replaced Tom Wilkinson (who left after 2000's "Close To A World Below") and Odious Sanction drummer Steve Shalaty has gone from touring drummer to permanent band member for the recently departed Alex Hernandez. Shalaty's skill level and overall talent is far below that of Alex Hernandez, although Shalaty goes for broke in trying to mimic Hernandez's signature percussive style - it doesn't come off believable in the broadest sense. In the songwriting department the rhythmic complexity of prior releases is far less present here and the tracks have become more accessible because of that. 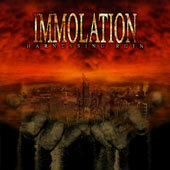 Artist Andreas Marschall isn't present either to provide his sixth Immolation cover, instead Immolation opted for Aborted's Sven de Caluwé to provide a digitally rendered artwork. Leafing through the lyric sheet it seems that "Harnessing Ruin" has become Immolation most social-political album to date, examples of this can be clearly found in the title track, opener 'Swarm Of Terror' and 'Dead to Me', which all serve as a outcry to the current political climate in the US. Moving on to the much debated production, I liked their earlier works better. "Harnessing Ruin" has a much clearer sound without the rough edges that we are used of this band. All in all, Immolation have once again crafted an album in their niche and have introduced a couple of changes in the process. Is this album therefore a disappointment? No, not at all - just listen closely before you purchase, I'd say.